Yesterday there were a few hard rains over Caracas. Nothing outside the norm, as in general the September October rains might be less frequent but tend to be harder and heavier. Once again, an Agua de Maiz overflow trapped a few cars on the central Caracas highway. Something quite amazing, that in a mountain city people are at a risk to drown inside their car by a flash flood on a major highway. A real risk as it happened in 2003, duly reported by this blogger then. Agua de Maiz is a "quebrada", a mostly dry torrent bed that has few or no water but that can fill up in a few minutes during a rain storm. 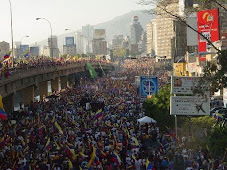 Caracas, as a valley surrounded by high mountains has many of such "quebradas" so there is ample knowledge, historical and practical, of the causes and consequences of each and everyone. Yet as the picture below shows it seems that we are far from being out of danger from these violent streams, even while riding a modern highway. So, what is it? Impossibility to control nature? Or failure by the authorities to do their job in either control the problem or establish a warning system? The later is the likely answer. September 1999 (Chavez in office for 8 months), 60 cars "shipwrecked", one death due to heart attack. May 2001 (Chavez in office for 2 years and 4 months), 100 cars piled up by the stream, and 22 families of an upstream poor neighborhood affected. July 2003 (Chavez in office 4 years and 6 months), dozens and dozens of cars piled up and submerged, one person DROWNED in his car! In the middle of the highway!